How an Average Family Can Retire Within 10 years of Working? Retirement! It's a word that many people use in their old age. To stop working and not having to worry about money is a dream come true for many. But retirement don't have to happen only when you're old. It can happen when you're young too. When we talk about early retirement, its known as financial independence. This means you don't have to rely on your job for an income to survive any more. Imagine the freedom to do the things you love, the unlimited amount of time you can spend with your kids and see them growing up. Imagine not having to put up with your unreasonable boss and don't have to go through the frustrating mid year and year end appraisals. Then imagine you can pursue what you really like or always wanted to do. In my previous article, I wrote on how if we saved 75% of our income, we can actually retire in 7 years. Here's the article: Save 75% of your income to retire in 7 years I also wrote that with Singapore's high cost of living, it seems impossible to retire at all with our average household expenses at more than $3600 per month. But, there's still hope for us if we plan it out diligently. With the help of an excel spreadsheet to visualise the numbers and stir up our imaginations, early retirement is certainly within reach. Yes, its early retirement and not late retirement. So how can an average family in Singapore retire within 10 years of working? With a household income of about $7000 and expenses at $2500, this household saves about 65% of their income which enables them to retire in 10 years. The age above is only for illustration purposes only so tweak it according to your age currently. Is $2500 per month expenses enough for a family? Now, some of you will probably be thinking will $2500 per month for household expenses be enough at all? Am I crazy or something to suggest $2500? In that case, let's look at higher household expenses of $3000, $3500 and even $4000 with the same level of income at $7000 per month. How long will it take to retire then? For $3000 expenses, it'll take the household 14 years to retire. For $3500 expenses, it'll take the household 17 years to retire. For $4000 expenses, it'll take the household 20 years to retire. The more expenses you have, the longer time it'll take for you to retire. Another point we need to take note is that most Singaporeans use their CPF to pay for housing loan instalments. In this case, we can exclude some of the housing cost that we pay monthly using CPF. Since I did not factor in CPF as savings, we should also exclude housing loans paid by CPF as expenses. $2500 may be enough for household expenses if we take the effort to live a frugal and simple lifestyle. Is 5% investment return realistic? For the scenario to work, the investment return must be at a minimum of 5% after inflation on an annualised basis. With inflation at an average of 3%, our investment return needs to be at around 8%. Is this achievable? Just by investing in the STI index fund, one will be able to achieve that kind of return and retire in 10 years. See for yourself whether its achievable? Is 4% passive income realistic? For the scenario to work, the passive income must also be reinvested in the first few years before retirement. Thereafter, we assume a 4% withdrawal rate from passive income to sustain our lifestyle. You may be thinking is 4% passive income achievable? Unfortunately, there's no way I can prove that a 4% passive income is achievable. This rate is debatable but I guess if you ask most people who do invest their money in stocks, a 4% dividend yield for passive income is not hard to achieve. The question is will these dividends be sustainable. There needs to be some active managing and rebalancing of investment portfolio involved. When you're retired, I'm sure you'll have lots of time to do that. 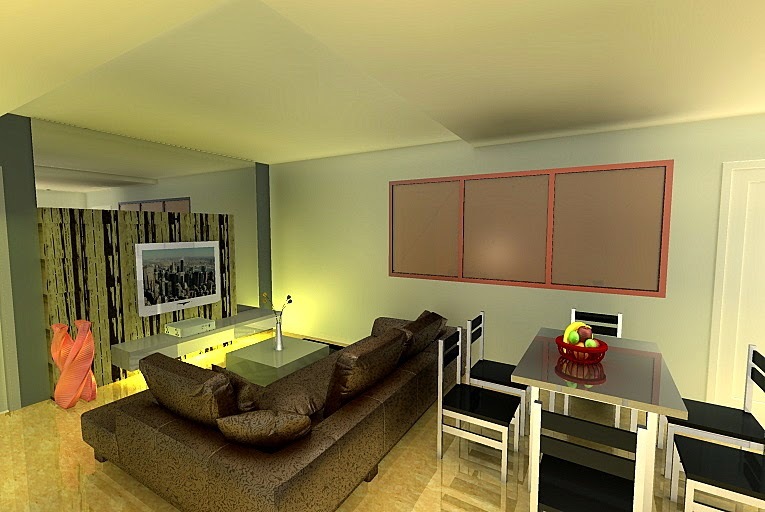 Another way is to have an investment property which you can rent out. If you're able to achieve the desired monthly rental to offset your expenses, you also can stop working indefinitely. Is $7000/month household income possible? Income is also important for the scenario to work. $7000 household income means $3500 per person for husband and wife. If you don't have this kind of income, not to worry. You can either reduce your household expenses or try to increase your income. Just remember, to retire in 10 years, you need to save about 65% of your income. If you save 50% of your income, it'll take 17 years to retire. By now, you should be familiar with the formula of how it all works out. What if I'm single? Can I retire in 10 years? Now, here's the truth. If you're single like me currently, then it's actually easier to retire as most probably your expenses will be lower. The amazing thing about the formula is that it works for a family and it works for a single person too. It's all in percentages. If you're single and can save more than 75% of your income, then it'll take less than 7 years for you to retire. Contrary to the believe that retirement is filled with images of old people idling around aimlessly, true retirement is actually the ability to find your own passion and pursue it. It is the ability to do what you love without worrying about money. This is called financial freedom. When you don't have to work, you can actually have more time to think about life and create products which will be beneficial to people and our society as a whole. You can do volunteer work, do part time teaching to help others or maybe write a book. Some of these will still generate income for you but the gist is even if it doesn't, you're still happy doing all of it. Early retirement aka financial independence is possible. Numbers show us how it can be done and it will become a reality as long as we can see it. 10 years to retirement for your family? 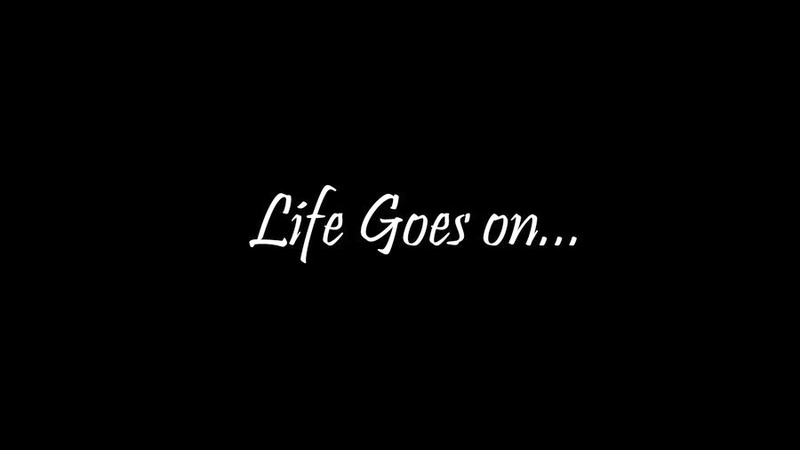 Watch and see how things can unfold for your life. Before I go on to my next post on how an average family can retire within 10 years of working, I thought it would be good to have a small discussion on luxury. I hope my previous post on saving 75% of your income to retire in 7 years inspired some of you to save up more. But of course if we consume too much luxury, then it is very hard for us to retire. How should we approach luxury in this case? Almost all of us like luxury. It seems like a human weakness to be attracted to the luxuries of life. That's probably why they are still around even though they are priced at an exorbitant price. A normal meal cost $4 to most people but another meal can cost more than $100 for another person. Similarly for a hotel, a normal room can be priced at below $100 for a night while a suite may cost as high as $1000 a night. Luxuries are mostly associated with rich people. Rich people are known to live in luxurious double story pent houses, drive luxurious cars such as Porsche and Ferrari and also take business class flights and stay in luxurious hotels when they travel. Average middle class people yearn for that lifestyle and dream that one day they will be in that position. Sometimes, imagining themselves to be in that position makes them feel good. But little did they know that luxuries can be an addiction that destroys their life. Luxuries can be enjoyed. They are meant to be enjoyed by us. They were created specially to cater to the best of human enjoyment. It is no doubt that indulging in luxurious stuff makes one feel happy. You feel like a king, a VIP as what we call it. However, it is our perspective on luxuries that make a difference between luxuries being good or bad for you. 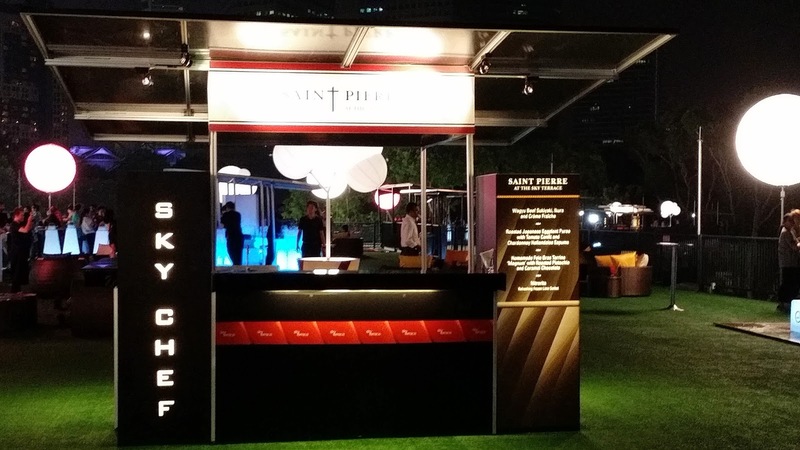 I did have a taste of being a VIP and an experience of indulging in luxury just last Friday during the Singapore F1 race event. Maybe some of you were there too? A normal walkabout ticket with no seat would cost maybe $30-$50 while a ticket with a seat would cost more than $100 depending on which zone of the track you pay for. I had the privilege to get a hospitality suite ticket which probably cost more than a thousand dollars. I had this similar privilege 3 years ago. 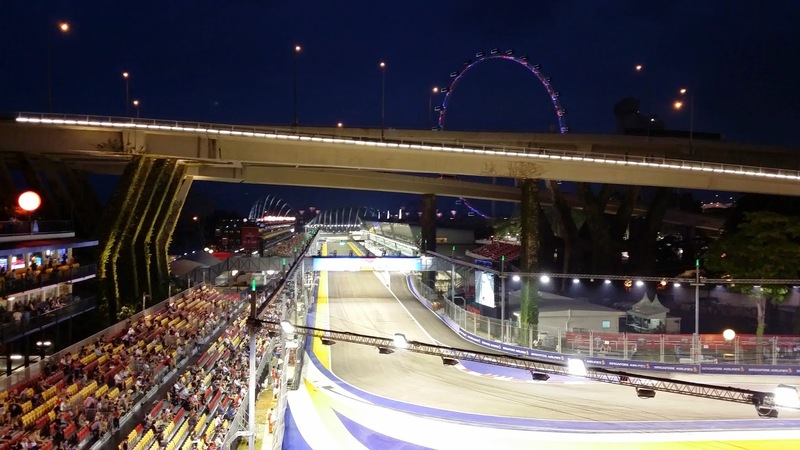 This package includes access to the air conditioned suite area which had a good view of the race track, an international five star dinner, an extensive wine selection and of course very good service from the service staffs. 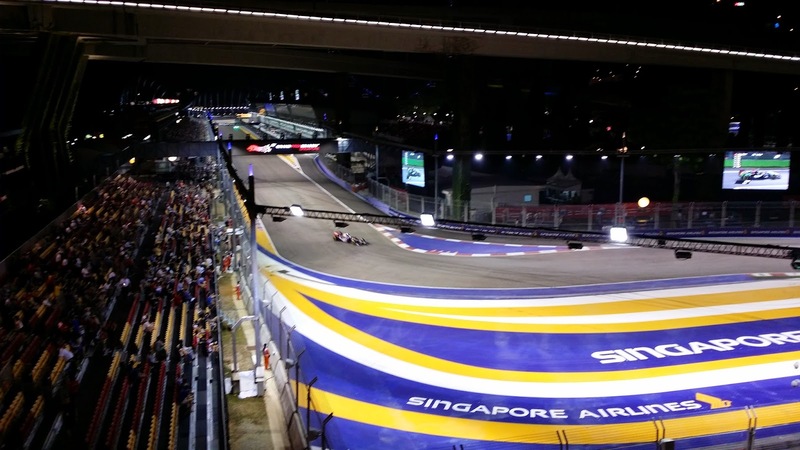 The food was good, the service was exceptional and the design of the suite plus watching the F1 race in the comfort of an air conditioned suite is certainly a taste of luxury. 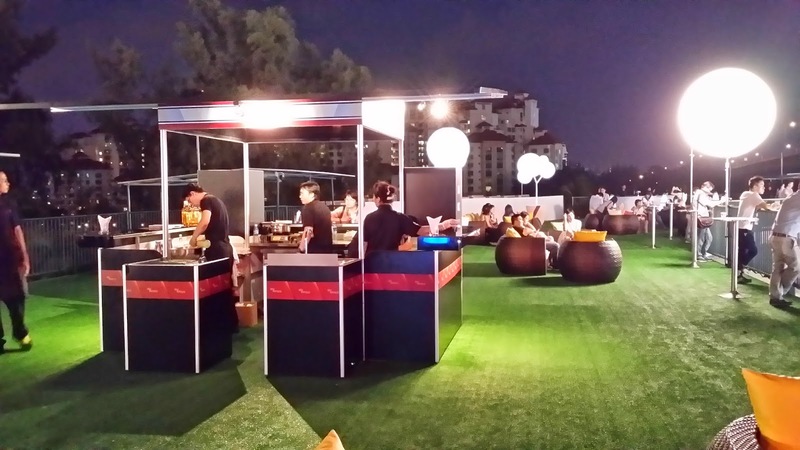 There is also a sky terrace where they furnish with sky bars, sofas and even more selection of exquisite food choices. 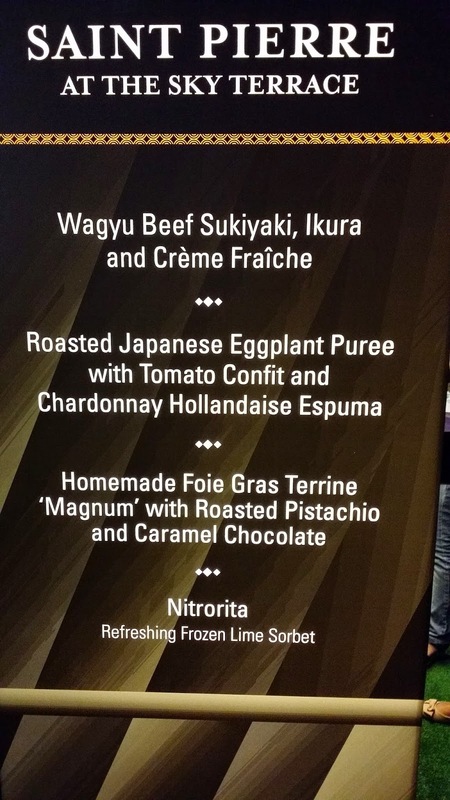 Apart from the five star dinner in the suite, they also had some other exquisite dishes at the sky terrace. Some of these looks foreign to me but I ate it anyway. 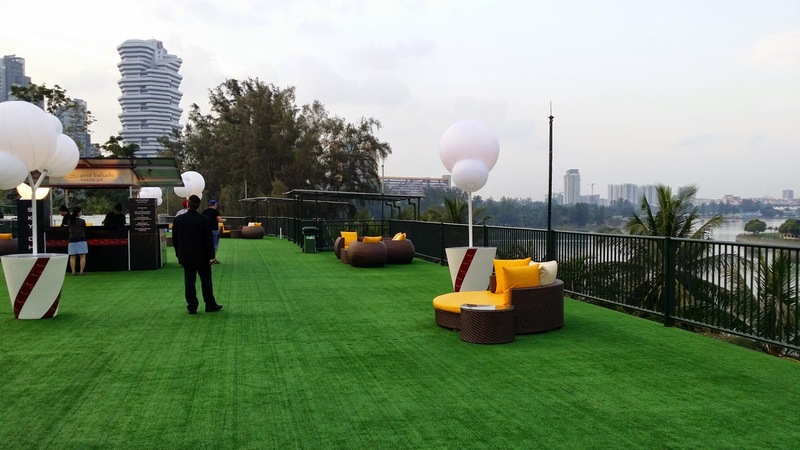 This is how the sky terrace looks like. Totally relaxing sitting on one of the sofas with people serving you drinks as you watch the race from the top. I even had a ticket to go to the Singapore flyer where I was given VIP access straight to the flyer cabin without having to queue up on the normal queue. 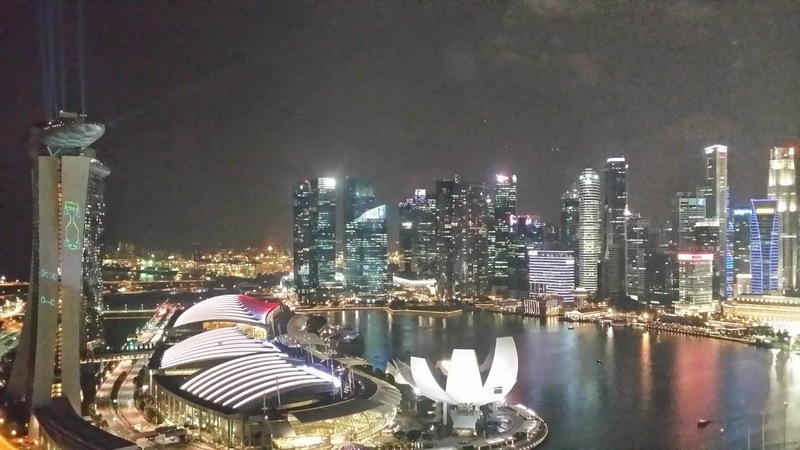 One of the stunning views I took of the Singapore skyline at night. So that was my luxury experience. It does feel good to be treated like a VIP. But to me, all these are good to have but not a must. If I've designed my life to make all these a must have, then my life would have been screwed. I know fully well that if I based my happiness only on consuming luxurious goods, then there will be lots of problems. You see, luxuries can be a drug. It is addictive but there will be problems when over consumed. Remember the first time when you took a sip of good coffee? What was the feeling like? You do feel a boost and feel more awake as what coffee will make out of us. But those who drink too much coffee will always say that coffee doesn't have an effect on them any more. They are numbed to the effect of it. Similarly, if luxuries are consumed on a daily basis, it loses its effect which is suppose to make us feel good. When luxuries loses its effect, you'll never be satisfied or happy no matter how much you have. It then becomes an addiction to seek even more luxuries where people are willing to borrow money to indulge in it. Over borrowing for a car or a condominium more than what you can afford are signs of over dependence on luxuries to make you feel happy. Some even borrow to travel luxuriously, borrow to buy branded goods. The list goes on. Even though this was the second time I've been to a hospitality suite, it still feels good as its only once in awhile. Approach luxury with the right perspective to enjoy it fully. It is tough to abstain from it totally so go ahead and indulge in it once in awhile but take caution that over indulging will cause it to lose its effects totally as what some fellow rich people do. Luxuries are best experienced as a boost and contrast instead of it being part of your daily life. 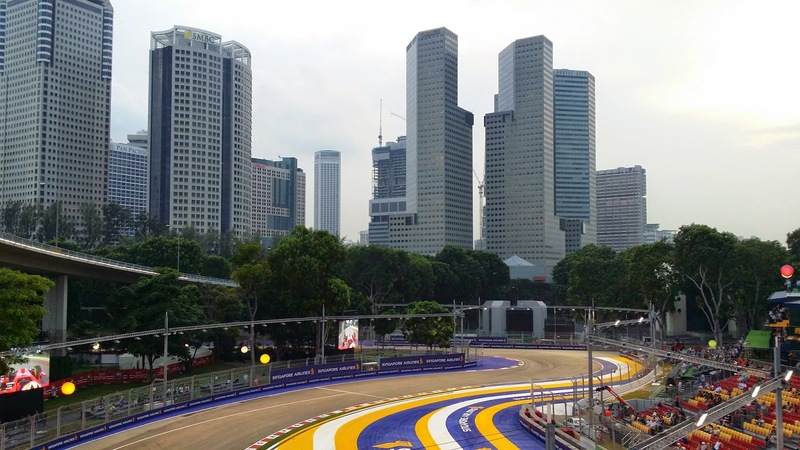 "Retirement is hard in Singapore." That's what we've heard before from a friend, a colleague or even your own family members. But, it can be easy if we know how to. How about being able to retire when you're young? That's what we call financial freedom. I've been reading a couple of financial blogs based in the US and one which particularly stands out was the blog called Mr Money Moustache. Oh yes, I like reading other people's blog too even though I own and write one. The owner of the blog retired in his early 30s and he was also featured in an interview with Yahoo! where he explained how he did what he did. This really captured my attention. In his blog, there's an article titled: "The Shockingly Simple Math Behind Early Retirement". The maths was if you saved 75% of your income, you'll be able to retire in 7 years. How was this number derived? Being curious, i decided to create my own spreadsheet to visualise how it will all work out. True enough, indeed if we save 75% of our income, we can retire in 7 years. Let's say if you earn $30,000 a year which is about $2500 a month. I think this amount should be quite achievable for most of us in Singapore. If we save 75% which is $22,500 or $1875 per month, we'll be left with $625 to spend per month. If the $204,301.70 invested generates a 4% dividend yield, the dividend income will be $8172. This gives us about $681 to spend per month. That's it, you can now retire and stop working. The dividends will continue to provide income for you for the rest of your life. According to my spreadsheet below, if you start working at the age of 24, you'll be able to retire by age 31. Sounds good? Is it achievable in Singapore with our high cost of living? Now comes the problem. The problem is in order to retire in 7 years, your expenses have to remain the same after 7 years. That means you can only spend $681 per month. Is this enough in Singapore? It may be enough if you're single but if you got a family, then it would certainly not be enough. An average household would already be paying about $1200 for their housing loan instalment. The above scenario of only spending $681 is certainly not enough. Adding up other miscellaneous bills and daily expenses, the average household expenditure would most likely be about $2500-$3000 per month. But wait, some of you may say $3000 is still not enough for a household expenditure. Straits times just reported recently that "the average household spends $1,188 a month on food, $811 on transport, $154 on package tours and holidays, $138 on other recreational and cultural pursuits, and $156 on clothes and footwear." This amount is not even inclusive of the housing loan. So if we add up the $1200 housing loan, this amount would be $3647. With an expenditure of $3647, how much do you need to earn in order to save 75% of your income and retire in 7 years? The answer is $14,588. Yes, you need to earn $14,588 to save 75% of your income in order to retire in 7 years! Some of you may think that saving 75% of income is too much. How about just saving 10%? If you save just 10% of your income, you'll need to wait 51 years before you can retire base on the earlier assumptions. Do you want to wait 51 years before you can actually retire? If you save 50% of your income, it'll take you 17 years to retire. It's all about the numbers and numbers can tell you the story. How to solve the problem and retire earlier? 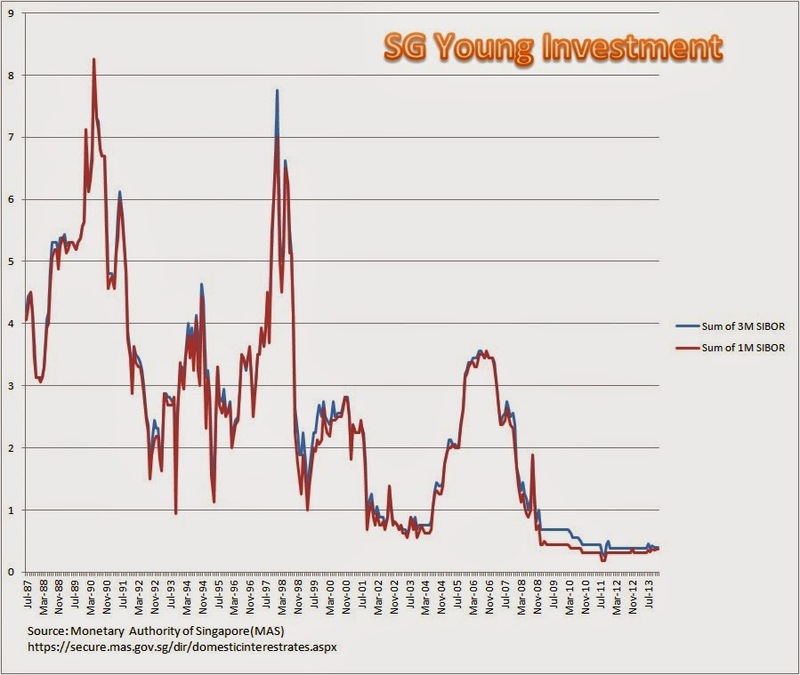 As readers of SG Young Investment, most of you would already know that we can increase income or decrease expenses to have more savings. However, in this case, its the savings percentage that is important. If you increase your income and at the same time increase your expenses at the same proportion, then your savings rate would still remain the same. If your savings rate don't increase, you'll never see a difference in your wealth. If you're able to increase your income but still maintain the same level of expenses as before, then you're in for a great future. If we earn $2000 now and can only save $400, its just 20% savings rate. But if we manage to double our income to $4000 and still maintain the same level of expenses as before, then savings rate get bumped up to 60%. Young people have the potential to make more money in time to come especially in Singapore where opportunities are plenty while older people may already be making quite a substantial amount of income right now. We can start planning for retirement no matter the age we're at. You just need to know the numbers and see your future. The percentage of your savings plays a big role in retirement planning. In my next post, I'll show you how an average family in Singapore can retire within 10 years of working. Stay tune. Why it is hard for most Singaporeans to retire early? I was about to publish some of the post on early retirement which I wrote over the weekends until I saw an article by business times today which shows how much Singaporeans are saving? These statistics was from the recent household expenditure survey which was published last week. Most of us would already have read that average monthly household income increased to $10,500. This number was met with many sarcastic remarks on social media. We would think how can this be true when most of us do not have that kind of household income? Is their average really average? The purpose of my post today is not to debate on whether the income figures were correct or not. Rather, it is all about the report by business times which showed another angle of that report. How much are Singaporeans saving? The 41st-60th percentile, who are essentially the middle class, are saving about 44%. This 44% seems to be a good savings rate but if we look closer, this savings include employer and employee CPF contributions. This is essentially not cash savings which we have in our bank. If we deduct away those CPF savings, we're left with about 9% to 15% cash savings since most of our CPF contributions is around 30%-36%. 9% savings is quite a low amount. If you calculate, saving just 10% of your income will probably take you 51 years to retire. Furthermore, the figures do not include non consumption expenditure such as income taxes and house purchases. We know that house purchases make up a big chunk of our expenditure. This makes the figures rather distorted. It is no wonder Singaporeans find it hard to retire in Singapore. Most still rely on their CPF savings but the problem is most of us also use the CPF for housing purposes. If we continue to do that, we'll always realise that we can't meet the minimum sum and can't retire comfortably. If we want to retire early at age 55 or even earlier, then we need to have more cash savings. It is no use depending on the CPF for savings and then realise you can't take most of your money out at retirement age. CPF was structured as a social security or safety net. It is not for us to take the money out in lump sum for enjoyment in old age. If we want some enjoyment and not having to worry about not enough money, then we need to plan and save up in cash. In the next few posts that I'll be publishing, I'll show you how most of us can retire early. Early retirement means in 10 years and possibly within 7 years. I've done up some calculations which will show you how exactly it is done. Watch out for the next posts soon. Once you reach that stage, you can continue working but you don't have to work for money any more. You can start to work on the stuffs you love, spend more time with your family and kids and even contribute more to society. People who have enough money to retire don't usually sit there idling around. In fact, they become more motivated to produce things which are beneficial to the society as compared to when they are just working for money. Are you confused on what are the stocks you should invest in? 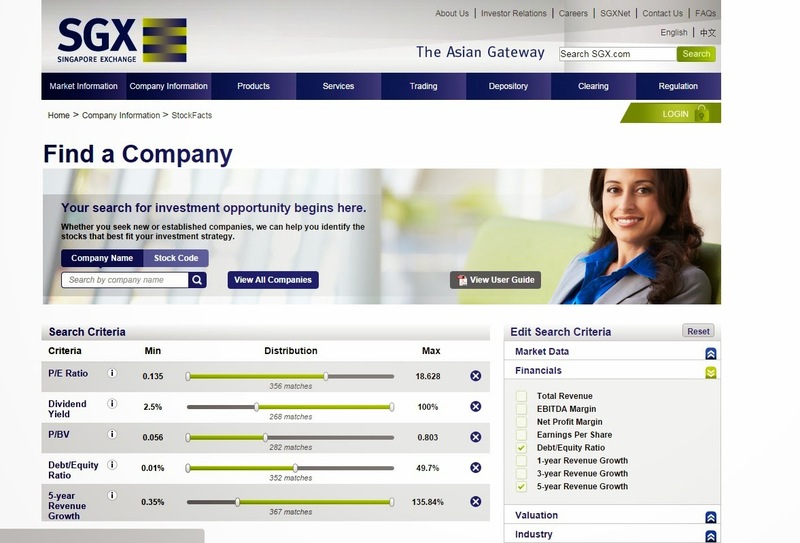 How to find the right ones among the hundreds of companies listed on the stocks exchange? I was playing around with SGX's very own stocks screener called StockFacts and its quite interesting. The screener provides quite a comprehensive screening criteria such as PE ratio, PB ratio, dividend yield, debt to equity and even 5 year revenue growth rate. I used the below 5 criteria to screen for some stocks listed in Singapore and it returned 29 results. Quite a good selection of stocks to research on it further. The screener definitely helps to screen out specific stocks which meets our investment criteria. Of course as investors, we don't just buy a stock base on valuations or even just base on dividends. We need to research more on what is the company about? Are its earnings sustainable? Basically, we need to know the business and how it operates. Nevertheless, this stock screener is good to use for a start. Finally, the ability to spend money without looking at the price tag. You see the clothes you like, buy! You see that pair of shoes, buy! You see that air ticket, buy! Does this sound like financial freedom? I once heard someone said that you will know you have reached financial freedom when you can buy things without looking at the price tag. However, there's just one problem. You will never get rich or achieve financial freedom if you're living your life like this now. Not looking at price tags sounds a bit too exaggerating. Most of us do look at price tags before we buy anything. Most of us even compare prices and try to buy at a discount. However, doing all these and you'll realise you're still poor. The problem lies in looking for stuffs to buy. But, its not just that. There's an even deeper secret to being rich. Delayed gratification is one of the defining advantages in our human life. Somehow, some of us will be able to put off spending now for a better future. Ask a dog or a cat to save money for their future and you'll have to wait a thousand years for it to happen. The signs of delayed gratification shows up early in life. From the way kids behave, we can see if he or she has the patience or the willpower to persevere in times of trials. When given sweats or chocolates, some kids will keep them for later consumption while some kids will take the opportunity to consume everything when their parents are not looking. Kids who are able to hold off gratifying their desires instantly will do much better in life in the future with fewer money and debt problems. What goes on in the kids' brain when they think of keeping or eating the sweats? Kids have good imaginations. They are also creative at that young age. They can imagine themselves to be super heroes or prince and princesses living in their own imaginary planet and castles. As we grow older, these imaginations start to fade away as we're caught up with the reality of this world. So what separates the instant gratification crowd from the people who can delay gratification? Why some kids keep the sweats while some pop it into their mouths instantly? A research by the University of Pennsylvania shows that the key to saving money for the future might not be self-discipline, but rather the ability to imagine that tomorrow, indeed, is coming. It was written in an article I read here. Those who could imagine a better future with the money saved now will find that saving money is easier. It is the aspiration of living a financially free life later in the future that prompted many people, including me, to start saving. A couple of years ago, I found some compelling edvidence that saving and investing money now will indeed reap many benefits in the near future. Yes its near and not when you're too old to walk or travel around. I found out that most people reach financial freedom in their early 40s and some even in their 30s when they delay some of the gratifications when they were younger in their 20s. Putting off spending will be hard for people who only think of the now. It is always the thought that if I don't spend now, then I won't have the chance to spend again in the future which kills the discipline to save. The future seems far for these people. However, the future does arrive faster than what we thought. Putting off that impulse purchase might not seem much at first but it is the lifestyle that is being built which is important. If you earn $2000 and can survive with just $500 per month, you're saving $1500 a month. When your income increases to $3000 and you still maintain the $500 lifestyle, you now save $2500. Money in your bank account will multiply faster than what you thought and you'll reach the financially free stage much faster than imagined. So, the next time you have the impulse to spend, think of what your future will be like if you continue living your current lifestyle. Will you retire at a young age or will you work to an old age? Kids have good imagination. Adults or young adults like us can have some imagination too. Housing loans - What to choose and what happens to your loans when interest rates goes up? There are many loan packages to choose from when you buy a house in Singapore. HDB provides concessionary interest rate to eligible flat buyers at 0.1% above the CPF ordinary account rates. It is currently at 2,6%. But, with the low interest rates environment, banks are offering very attractive low interest rates packages from as low as 1.5%. That is 1% lower than the HDB loans that is being offered. However, low interest rates may not be a good thing. They are most likely associated with variable interest rates packages or floating rates packages. What happens to your loans when interest rates goes up? Before we look into what happens if interest rates goes up, let's take a look at 2 typical types of loan packages offered by the banks. The first is short term fixed interest rates and the second is variable interest rates and SIBOR dependant rates. There may be other packages offered by foreign banks but let's focus on the local banks in Singapore here first. I've check on the local banks in Singapore and they seem to offer only short term fixed rates packages. For POSB, its 5-8 years fixed. For UOB they do not display their packages. For OCBC they only offer fixed rates for the first 1-2 years and for DBS, its similiar to POSB. 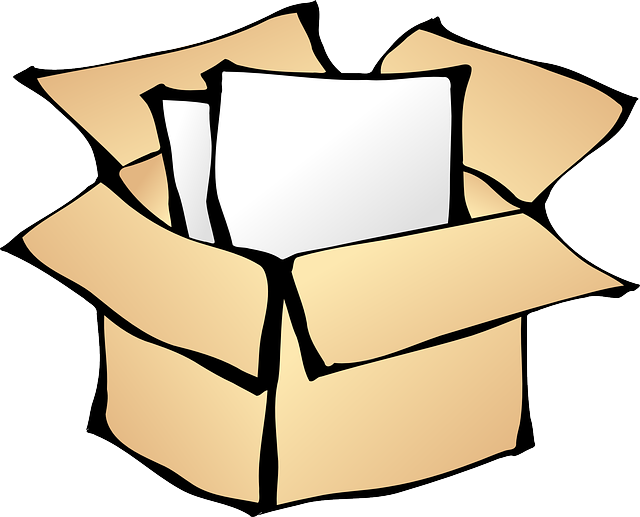 Typically, the interest rates offered on fixed rate packages are higher than the variable interest rates packages. After the fixed rates term, the interest rates will be recalculated. For OCBC, it is stated that thereafter, the rates will be based on the bank’s Board Rates minus a discount stated in the Letter of Offer. It simply means that your monthly loan repayment amounts may change after the fixed rate periods. For variable rates packages, it can be based on the bank's board rate minus a discount stated in the letter of offer as in the case of OCBC. It can also be SIBOR dependant rates where the rates follow the SIBOR rate plus a fixed percentage. For OCBC, its 3 Months SIBOR + 1.25% throughout. So if SIBOR rates increases, the interest rate increases as well. Confusing? Not to worry, I'll explain what is SIBOR below. Some may ask what exactly is SIBOR? In its original form, it is called Singapore Interbank Offer Rate. This is a rate which Singapore banks lend to each other. You may have heard of the London Interbank Offer rate (LIBOR) which is used in the UK. 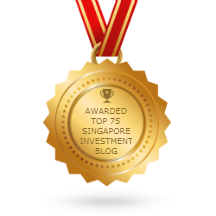 We can find the SIBOR rate from Monetary Authority of Singapore(MAS) website. The 3 months SIBOR is currently at 0.407. Most banks use either the 3 months or 1 month as a benchmark for their SIBOR dependant rates. So, if you take up the OCBC SIBOR dependant rate loan package, the interest currently would be 1.657% (0.407 + 1.25%). This is somewhat 1% lower than the 2.6% rate package which HDB offers. Interest rates may go up? 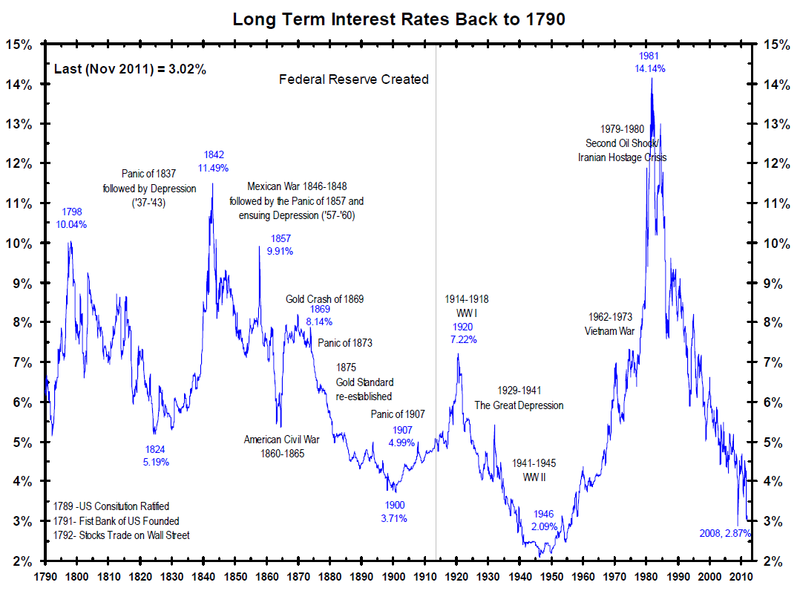 I manage to find a good chart illustrating the history of interest rates in the US from 1790. That was a long long time ago. From what i see, the average interest rates throughout history is about 5-6%. We're in an era of extremely low interest rates now. Will interest rates go up from here? The lowest interest rates the US had was about 0.25% just last year. How about the interest rates in Singapore? We should be concern about this as it will definitely affect the loans we have to pay. Singapore normally follow the interest rates of big economies such as the US. I only manage to find the data of Singapore's 3 months and 1 month SIBOR rates from 1987. The data was take from MAS website which I plotted into a chart. From 1987 till now, the 3 months SIBOR has been on a long term down trend. The reason for the decrease in interest rates is to encourage growth through spending during times of recession or crisis. As interest rates are lower, businesses and individuals can borrow more money at a cheaper rate to buy houses, cars, lands, build factories etc. Interest rates will rise when the economy starts to pick up. This is to control the level of inflation in the economy. If interest rates do not rise by then, hyper inflation may happen which causes prices to rise at an unimaginable level. What happens if interest rates goes up? Interest rates are near zero now. It is a matter of time before it rises. There's no way interest rates can go any lower. Look at the time in the 1940s when interest rates were near zero also. It later went on a 30 year rise up to 14% in the 1980s. When it rises, your monthly loan repayment amount will rise as well. But, how will it affect us? Let's take a look at some scenarios. If you've bought a HDB flat and took up $300,000 loan, your monthly loan instalment base on 1.6% interest and 25 years repayment period is $1,214 per month. This may be the sum many of you are paying for your housing loan now. If interest rates rises to 2.6%, your monthly loan will then be increased to $1,361. That is more than a $100 increase per month. If interest rates increased further to 3.6%, your loan instalment would also increase further to $1,518. This is $200 more from the original amount you had to pay. Do also note that the TDSR framework set by the MAS will still apply when you refinance. The TDSR means that your housing loan repayments, after adding all your repayment obligations (student loans, credit card debts, car loans, personal loans, etc. ), cannot exceed 60% of your income. When interest rates goes up, the standard practice is to switch to another home loan with a lower interest. But with the TDSR, some who try to refinance may find that they don't meet the 60% TDSR which means they will be stuck with their higher interest rates home loans. However, those who bought a residential property before the TDSR rules were introduced will be exempted. 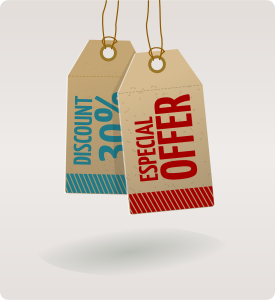 The option to purchase (OTP) must be granted before 29 June 2013. 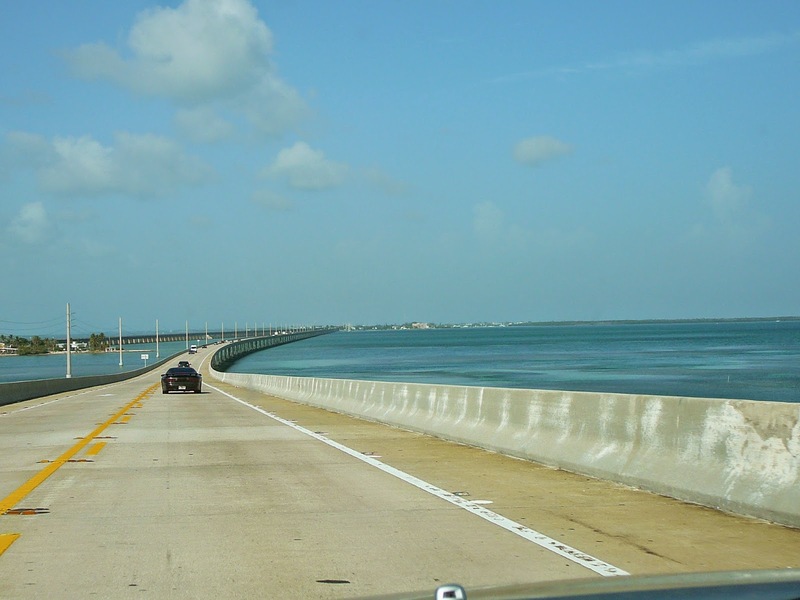 The owner will be granted exemption as long as he occupies the residential property that is being refinanced. If you're planning to take a loan or have already taken a loan for your new house, do take into consideration and prepare yourself in the event of a rise in interest rates. The rise in your loans amount would probably be in the range of $100-$200+ monthly for a $300,000 loan. For those with even higher loan amounts, the increase would definitely be bigger. For a $500,000 loan, a 2% increase in interest rates will increase your loan amount by about $500 per month. Are you prepared for it? The HDB loan interest rate is pegged at 0.1% above the CPF ordinary account interest rates. The rate is not fixed and may increase and decrease as well. However, as we know, the rates of the CPF rarely changes. Many people have seek for the increase in CPF interest rates but it still did not happened. Well, i hope it does not. If CPF interest rates really increases, those people with housing loans from HDB would be in trouble. There isn't a long term fixed rate loan package in Singapore. DBS and POSB offers 5-8 years fixed rate which is probably the longest we can see. The HDB loan is also not a fixed rate loan but at least its rates doesn't changes too frequently. In anticipation for a rise in interest rates, we should look for alternatives which gives us peace in our lives. You can refinance for your current loan or choose the right loan package when buying a new house. It is still not too late to make the right decision today. Saw an interesting video by MoneySense which encourages people to take charge of their finances. Not only should we plan for ourselves but plan for our families and love ones as well. It's only a 2 minutes plus video but does bring forth its message clearly. Enjoy the video! Sometimes, we're too engrossed with our lives and forget about the people around us. Plan and save for the future you want today! How to spend on an overseas holiday but still have money? In the current society we live in, everything requires money. Or maybe we should say almost everything requires money. Besides our daily necessities, as humans, we also desire to spend on luxuries such as an overseas holiday, eating out at restaurants, buying a car etc. We have heard of the need to save and save. But the truth is, we still need to spend and we want to spend on some enjoyments. Now, how do we spend on enjoyments but still have money after the indulgences? 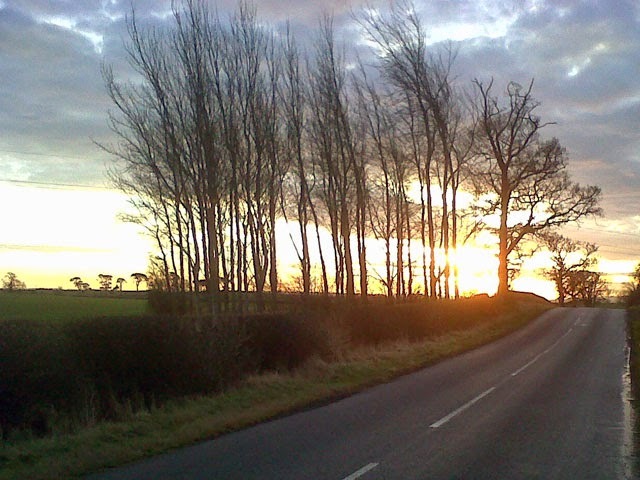 An overseas holiday is what most of us will go for if we want some enjoyment. A holiday to Europe probably will cost you a few thousand dollars. Most of us will try to save up for a few months before going for an holiday. After spending that few thousand dollars on that holiday, we're back to square one. Our bank accounts are empty again. Now, hear the good news. There's another way where we can spend on that holiday but our bank accounts will never be empty. This is probably what rich people practice which enable them to stay rich. The rich get richer and the poor get poorer. I first read and heard of this method from Robert Kiyosaki's various book including his best selling book Rich Dad Poor Dad. It is a book which changed my mindset on money completely. As we can see above, most will have a salary from their job and they will save and spend certain amounts. After they have saved enough, they will indulge in some enjoyments such as an overseas holiday. It will be hard for this person's savings to grow as after they spend on that holiday, their savings account is empty again. The next person also has a salary and also saves and spend a certain amount. The difference now is this person uses his or her savings buy assets that generate income. This extra income generated from the assets bought can be used to supplement the indulgence on an enjoyment. In this case, we use the example of an overseas holiday again. The above person continues to use his savings to buy assets that generate income. If he does not use all of the extra income on the holiday, the extra income goes back to his savings and it continues to grow. With the extra savings, this person can buy even more assets which generate more income. The extra income which is generate can grow exponentially and this person may have free money for indulgence for the rest of his life. Passive income is a powerful concept. However, it is not taught to us in schools or in the corporate world. Most of us will only know we need to work hard, save money, spend below our means etc. But, somehow we do not like the idea of saving money just for the sake or saving money. There needs to be a purpose to saving money. With the concept of passive income, saving money has a purpose. That purpose is to buy assets that generates income. When I want to go on an overseas holiday, I will seek to create passive income for that holiday. After enjoying the holiday, my savings is left untouched and the assets I bought continues to generate more income even after I went on that holiday. The assets that generate income can be from stocks, properties, business, intellectual property such as books or websites etc. Let's take the example of stocks. If you use $50,000 of your savings to buy good stocks which gives an estimate of 6-7% dividends on average, you'll get an extra $3000-$3500 a year in passive income. This amount should be sufficient for you to travel to some countries. The more money you have, the more passive income you can generate from stocks. There will be people who invest in properties and rent it out. They receive rental income which is also a form of passive income. Then there are also people who start their own business, create products, write books, start a website etc. All these will provide extra income for you. The key is to know where to focus on and find out the ways to do it. If you can do all, that will be even better as passive income will come from all different places. This is called multiple streams of income. 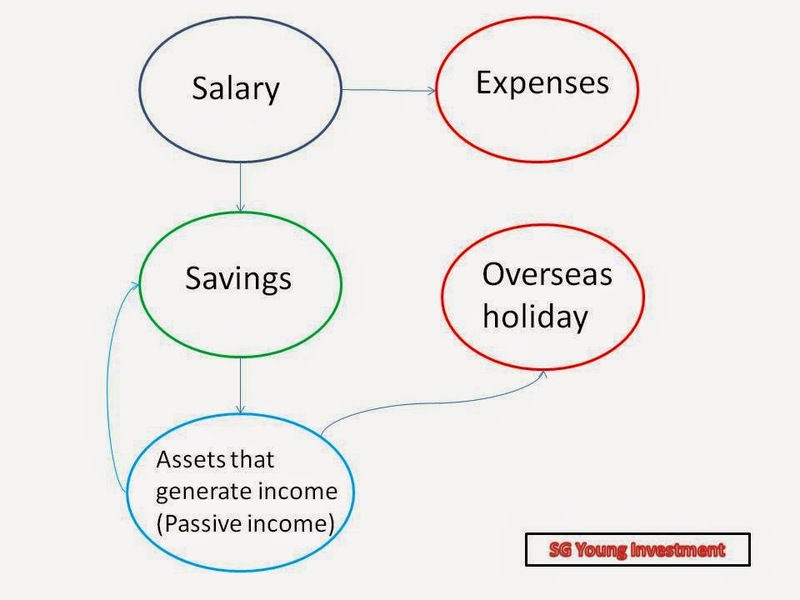 Passive income is different from the active income we get from our salary. It simply means that even if we lose our jobs now, our passive income still remains while our active income stops. If we build it correctly, passive income can grow larger and larger until it replaces our active income. It takes awhile to build but it will be worth it. The next time you think of having a holiday, think about how to create passive income for that trip. This is the first step to many great things ahead. You will be able to experience another realm of spending which is different from the traditional way of spending. What to do if your savings were wiped out after marriage and paying off loans? I had a comment from a reader on "My financial goals" page today. This comment reflects the reality of living in Singapore. "I am an engineer, turning 30 this year. After paying off my university and other loans, I am left with nothing in my hands. I am married, wanna have babies soon. How do I start saving and investing then?" I believe there are many others who also had their savings wiped out after having a wedding, paying off school loans and even have their CPF wiped out when they buy a new house. I told the reader that I've not been through this stage so I won't understand how the situation is like. But I added on that I believe all of us can start all over again. There are 2 ways to saving more money. One is reducing your expenses which requires some sacrifices and the other is to increase your income. Both have to work together hand in hand. Of course, after marriage, most of us will want to have babies as what the reader also desired. Having kids will surely increase your expenses and I would say there is no way to predict how much it would cost to raise a kid up. However, I would not suggest anyone to not have kids just because he or she has no money. I'm in no position to suggest that at all and if I'm in similar situation, I may also want to have kids of my own. I'm sure there are some of you who've been through this situation before who can give a better advice on the situation above. So did you manage to start saving and investing again? Feel free to share and comment below if you've been through this stage or is going through this stage now. The book: "5 elements of successful investors" is a book on how different personality types can affect the behaviour of investors and how we should discover our own personalities and find the investing style that suits us. There are many instruments and many styles of both investment and trading. I discovered that most people will start with trading in Forex, stocks, Options as it looks really attractive to make more money. Young people want the fast pace and hype in trading these products and many think that they can learn and succeed in it just because they are young. Then there will be older people who also want to have a try in trading and think that they too can succeed in it with their experience and maturity that they have. However, this is often not the case and most lose money in trading. Why people lose or make money? Some of us may think why do some people make money while some lose money? The answer lies deeply in the understanding of our own personalities. 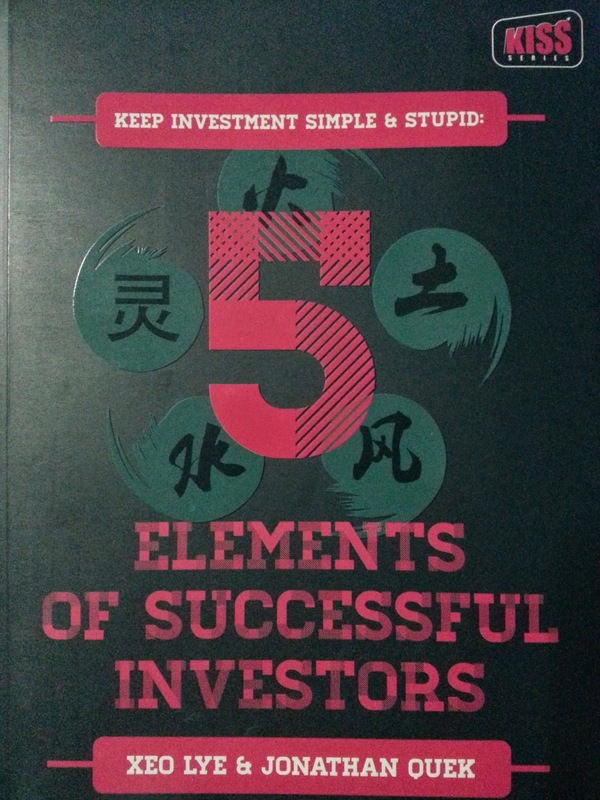 In the book "5 elements of successful investors", the authors, Xeo Lye and Jonathan Quek, will give you 4 + 1 personality types to let you understand yourself better. The 4 elements they have are Fire, Earth, Air and Water. The last element is the Spirit which is quite interesting. They even have a check list questionnaire to determine which personality type you most likely belong to. Xeo Lye Co-authored the book with Jonathan Quek. Xeo is known for his speaking role in Singapore's national financial literacy program "Moneysense" as well as his involvement in a series of financial talk shows with Singapore's Mediacorp Radio. He is the co-founder of Capitalgainsgroup.com which is a financial games design company that aims to help people understand the complex world of finance through gaming workshops, board games and mobile applications. He's passionate in educating the public on financial matters. Jonathan Quek is active in educating the public on financial education. He has been featured in various financial summits and expos in Singapore and Malaysia. Just recently, he was a speaker at financial growth summit and invest fair in Malaysia. He's the founder of SilverMalaysia.com, a financial youth intelligence and wealth insider group. The book continues to talk about financial literacy in our society. Family background and social pressures will affect our financial decisions and habits in life. This in turn affects our personality. It even teaches you how to find the right financial advisor and warns you on some of the deceptions that so called "Gurus" communicate to us. The thing I like about the book is it also has a history of the world economy and how markets performed over the years since the early 1900s. An understanding of history and economics is important in investment as it helps us to learn from past trends which creates a cycle of boom and bust. The book is already sold in book stores in Singapore. It will be beneficial for investors who want to understand their investment personality better. This is my personal opinion after reading the book sponsored by the authors themselves. Thank you Xeo and Jonathan for the book! Life is like a journey. When we're born, we were raised up by our parents and take up the role as babies for the first few years. For the next decade, we assume the role as students and go to school, do home work plus sit for exams. After we graduate from school, we start our journey in the corporate world and work for the next 30-40 years before retiring at the end. I'm sure most of you are familiar with the situation i've just described. Some of you may still be students, some of you have just started working while some of you may already be in your retirement years. Life seems like a cycle. It begins and it will end one day. However, in the midst of it, there are important decisions which we have to make. 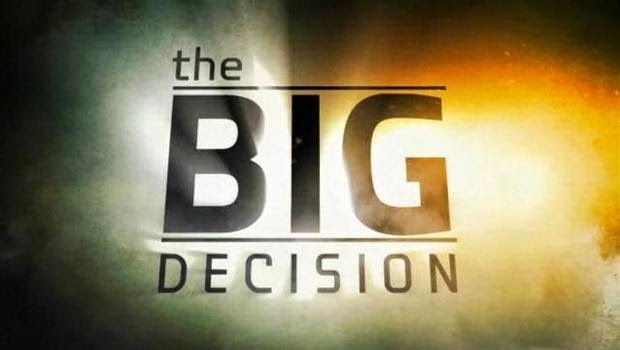 These decisions are important as they are big decisions which will make or break your life. So what are they? In schools, we learn all the languages, mathematics, science, history subjects and much more. These knowledge are important for later parts of your life. Learning a language such as English allows us to communicate effectively. Mathematics allow us to solve problems and science gives us the knowledge of how stuff works. However, in schools, most of us have never learnt anything about money. How do we budget? How do we use credit wisely? Most of us are at a lost on how to manage our finances or some of us do not see the need to manage our finances. If schools do not teach and your family do not teach you too, then most likely you'll be lost in it. The good news is now there is a new syllabus in secondary schools to teach about financial literacy as announced previously by Deputy Prime Minister Tharman Shanmugaratnam. The new syllabus is called food and consumer education and it replaces the home economics course which we had in schools last time. This is being offered to secondary 1 and 2 students only. If you would like to know more about the program, just Google Food and consumer education and you'll be able to find the relevant information by Ministry of Education. This is certainly good news to me as students get to learn how to manage money wisely at a young age. For the rest of us, we may not be so fortunate to learn how to manage money in schools. But, this knowledge is still necessary especially if you're planning to get married. As we grow up, we begin to make decisions on our own. Some are big decisions in life. The first big decision which involves money that a lot of us make is to get married. Some of us spend a large sum of money on a wedding. Others spend a minimal amount of money for their wedding. I wrote about the cost of a typical wedding in Singapore before. Read: How much money is needed to get married and start a family in Singapore? So how much was the cost? The cost of $56,000 shocked many people. There are couples who spend $100,000 on a wedding while some others spend only $900. Wedding cost can be subjective and it depends on individual couples on how much they want to spend on it. What we need to take note is to have a proper budget before your wedding. Borrowing and spending money you do not have for a wedding may be the worse decision you'll make as the debt comes back to haunt you after your marriage. So, budget the cost, prepare and save up that amount before getting married may be a better choice. If not, settle for a cheaper alternative wedding if you really can't afford it. "20 years down the road, the same old money issues will surface again and again. It all boils down to living within your means, and forget about ‘face-value’. A standard wedding hotel dinner packages in 1990 starts at $800 to $2,000 per table. Instead of the usual wedding, my wife and I booked a small corner at a café in a hotel for buffet dinner, 30 pax at $23.95 per pax. That’s our wedding banquet. No fancy outfits. No fancy decorations. But we had joy. The monetary gifts covered the entire wedding dinner. Our first home was a 5-years-old re-sale 3 room flat costing $67,000 at Bukit Batok. The only renovation cost were the few cans of paint and labour provided by friends with beers as payment. For the first 10 years of our marriage our focus was on raising our beautiful children, career advancements, savings and savings. The holidays were simple, Malaysian beaches and towns. Today, my wife and I are in our late 40s. Happily married. Our daughter is 20 and son is 15. We’ve no less than 8 properties spreading over Singapore, Australia and Malaysia. No less than 3 fancy cars and annual European holidays. I’m not writing to show-off. The point that I’m trying to make is marriage has nothing to do with the amount of money one spent on the wedding banquet or renovating/buying a new home. It has to do with love. If a couple loves each other they will sacrifice and compromise …….. to achieve their dreams. The dreams of building a sustainable family. The dreams of bringing up children in a warm lovely home. The dreams of building assets with no whatsoever issues of insufficient money. To do this, the first step is avoid debt. Forget about excessive big wedding banquet with exorbitant photography/video packages. Just make it simple, dinner with family and close friends with less than 5 tables. Be yourself. Be merry. Marriage is about love not the amount one spend on his or her wedding. Also, the family you’re going to build is not judge by the renovation." A simple wedding can also lasts a lifetime of happiness. It's not about the wedding. It's about the life after that. The second biggest decision we have to make is buying a house. This is a cost that most of us have to pay for the next 25 years. I wrote before that for a $300,000 HDB flat, the monthly instalment will be $1225 per month for 25 years. Not forgetting that we need to pay a 10% down payment of $30,000 first. This seem like a scary thing for young couples who have just started working or worked only for a few years. This includes the down payment and also the renovation and furniture cost. Nevertheless, i said before that it is possible to save up for a house as well as for a wedding. It takes around 2-3 years for a couple to save up in order to start a family. So, plan early to avoid hiccups. Again, it is important to budget. If you realise you can't afford a 4 room flat, then there's always an option to get a smaller one. This was important because of the limit to the amount of debt you can take also known as the Mortgage Servicing Ratio(MSR) for HDB flats. It is capped at 30% of your gross monthly income which means you cannot take on debt more than that. I also wrote on the various housing grants available which will help us lessen the burden of owning a house. The last big decision we have to make is planning for retirement. Many of us find out how to book the wedding package from the hotel, how to apply for a BTO HDB flat but most of us do not plan for retirement or do not know how to plan for it. But, it is actually the most important aspect of our lives after working hard for the past 30 years or so. Imagine if you start working at the age of 25, retire when you're 55, you would have worked 30 years. If you live till 85 years old, that would be another 30 years in retirement. Your retirement years is actually equal to your working years. 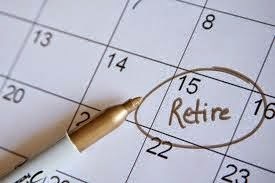 30 years in retirement is a long time and if you do not plan for it, how are you going to have enough money to live through it? But of course, some would say i can work till 65. So retirement years are shorten to 20 years. That is still a long time. Then, there will be people who say they won't live that long so don't have to plan for retirement. But the problem is, none of us can know how long we can live. What if you really live to a ripe old age? The truth is, life expectancy is getting longer. Cost of Retirement: $1 Million Dollars? I first heard of this 1 Million amount about 8 years back when i was studying for a diploma in one of the local polytechnics. I was listening to a financial advisor who told me that i would need $1 Million dollars by the time i retire 40 years from now. I was confused at this idea because i thought who can really save up a Million dollars? Does that mean everyone has to be a millionaire just to survive in Singapore? To find out if this is true, we just have to do a simple illustration. According to the simple illustration above, with $1 Million dollars you can spend about $2777 per month for the next 30 years. Is this enough for retirement? I think this amount should be quite enough to live by bearing in mind that inflation will happen through the years and things will get more expensive in the future. If we have $500,000 only, then the amount available for spending during retirement will be halved at $1388. Now, $1388 seems like too little to live by especially if its 30 years from now. A $3 chicken rice may have become $5 or $6 by then. So perhaps, $500,000 is not enough for retirement? By now, all of us should know what is the CPF after all the discussions and attention that it had gained through social media in recent months. PM Lee also gave a detailed explanation on the CPF during his National day rally speech. In essence, if you've met the minimum sum of $155,000 currently, you would expect to get an estimate of $1200-$1300 per month from age 65 to the day you pass away. As the minimum sum increases, the monthly payouts will increase as well. It was announced that the minimum sum will increase to $161,000 next year. Still, $1200 per month may be too little for retirement. Some may also think they don't want to retire at age 65. If you want to retire earlier, then planning early is important. We just have to take into consideration that the CPF will supplement our income from age 65. To me, it is only an additional bonus and not a necessity where we depend on it fully for retirement. 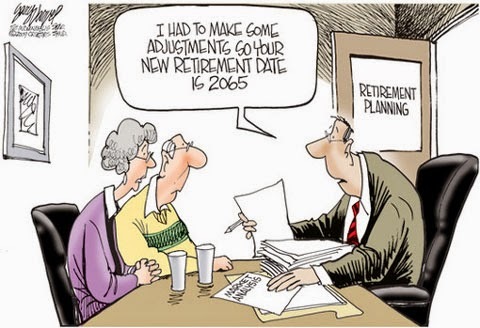 How do you plan for your retirement? There is no exact way to plan for retirement and that's what makes it confusing for many people. We always want to find the model answer to problems but some how, some things never have a model answer. One way i can think of to plan for retirement is to set a target amount you want to achieve and work towards it. If you want $500,000 at age 55, then set that long term target and also set a few short term targets. For example, $100,000 at age 30, $200,000 at age 40, $400,000 at age 50. The figures may seem hard to achieve at first but if you break it down further, it'll seem easier. For $200,000 at age 40, let's say you start work at age 25, from age 25 to age 40 it'll be 15 years. So, to achieve $200,000 by age 40, you need to save $1111 per month for the next 15 years. Seems achievable now? The above is the traditional way to retirement where you save up so that you can draw on it for future spending. You will draw on your savings for retirement. There is another better way where you still save up but this time round, you do not have to draw on that savings. This is done through creating passive income where you will have income for the rest of your life even without working. Are you prepared for the 3 big decision of your life journey? 3. How much money does a couple need to earn in order to afford a $300,000 HDB flat?